The client’s brief was to extend the kitchen/dining room to the side to provide a generous and well-lit family space, and to add a loft bedroom and shower room to their 2-storey Victorian mid-terraced house. The project also includes thermal improvement of the rear addition envelope (insulation + render system and roof refurbishment), as well as restoration of the front facade and hard landscaping (patio) to the rear. The materials used on the extensions are zinc in combination with aluminium-framed windows and sliding-folding doors, offering long-term durability and low maintenance. 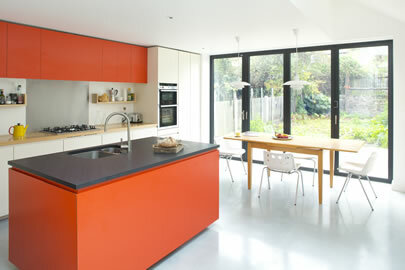 Internal finishes include concrete and oak flooring, coloured laminated panels and ash and slate worktops.